An inquiry into the long-running application to build a golf development on specially-protected sand dunes in Sutherland is set to begin. An American businessman wants to construct the controversial course on the Coul Links site near Dornoch. Todd Warnock believes it will create much-needed local jobs and it has the backing of some local residents. But environmental groups insist it will devastate one of Scotland's most important protected habitats. 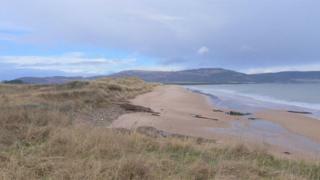 The sand dunes border Loch Fleet, the most northerly inlet on the east coast. As a whole, the site provides habitat for wintering birds and rare plants. It holds three protected designations including that of a Site of Special Scientific Interest. Jonathan Hughes, the chief executive of the Scottish Wildlife Trust who used to work as a warden at the site, described it as "the most wonderful wild stretch of coastland". While wandering through the dunes, he told BBC Scotland: "It's just about got the highest level of protection you can have for a nature site in the UK. "We have these wonderful winter loch systems which flood in the winter and are fantastic areas for wintering wild fowl. "Then in the summer, they dry out and burst into life as these wonderful wet wild flower meadows." He added: "It's one of the most important coastal areas that I've ever seen in Scotland and it has an amazing diversity of wildlife. "In terms of the damage that the golf course would cause, we're talking seriously significant damage. It would never recover." One of the major concerns is that fertilisers, required to build and maintain the golf course, would seep into the wetlands. Conservationists believe that would fundamentally change the composition of the land. But resident Yvonne Ross insists the golf course would bring much-needed land management to the site. She said: "It is a beautiful area but I think a golf course will only serve to enhance that area. "I think the management of it will save it becoming even more barren. "The development is going to bring some jobs with it but it's the knock-on effect that our community has been looking at and I think the Coul Links effect has already started in Dornoch with the types of businesses that want to come here." Ms Ross said she hoped ministers would approve the planning application at the end of the inquiry and feared for the consequences of it being thrown out. She added: "I think it [would] have a serious impact on the community and probably on the Highlands as a whole, saying we're not open to investments and we're not open to new way of managing our land." Oystercatchers, red shanks and curlews are regular visitors to the site because of its intertidal sand flats. Nationally, species of eelgrass provide an important food source for waterfowl and a shelter for juvenile fish. Permission for the development was granted in June 2018 by Highland councillors. But the planning application was called in by Scottish ministers following increasing pressure from the environmental community. The World Commission on Protected Areas wrote to the Scottish government saying the decision was of "significant concern". Mr Warnock said the democratic process had been "comprehensive and fair" and urged ministers not to call it in. The inquiry, at the Carnegie Hall in Clashmore, is expected to last between four and six weeks.